The Comox Harbour Marina Park is located on the waterfront in the community of Comox, BC on Vancouver Island, British Columbia, Canada. 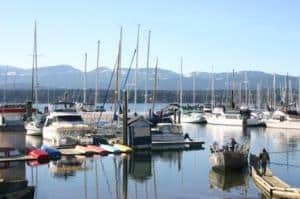 The park is a main boating and sailing destination in the Comox Valley providing many visitors with the necessary boating services required when in the region. From the Marina Park one can explore along a short boardwalk path or venture out along a waterfront rock pier. At the entrance of the marina is a day use park with picnic tables, a playground, a shelter and some grass lawns. The waterfront park is an ideal destination for birdwatching, picnicking and for watching marine traffic come and go. 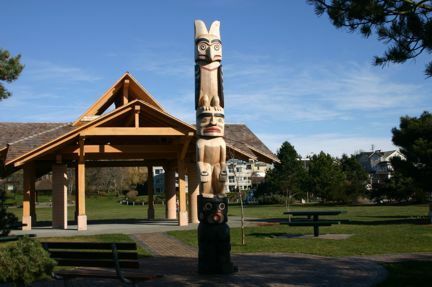 The park is centrally located in the community, close to restaurants and shops, making it a good starting location for a self guided tour of the community. How to Get Here: Travel Highway #1 to the community of Courtenay, BC on Vancouver Island, BC, Canada. Travel the Inland Highway (Oceanside Route) towards the downtown core of Courtenay and cross the bridge. On the other side of the bridge turn right towards Comox Village. In Comox follow Comox Avenue to Wilcox Rd. The marina park is in sight.